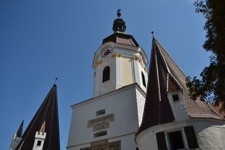 After a good day in Bratislava, it was time to come back to Austria for the rest of the trip. The GPS was programmed successfully for a 2 hour drive to Krems. We went there to walk the quaint town, to buy from a Thomas Sabo store and to visit an Orange store to try to straighten out my SIM card problem. We were successful on 2 of 3 fronts. The town was lovely, the Sabo charms purchased, but after 1.5 hours of backing up and restoring my iPhone, the card still didn’t work. Chances are very good that Verizon/Apple didn’t execute the unlock successfully. In hindsight, not a good use of time and not very important. Hotels have wifi and not difficult to find a hotspot in many places. 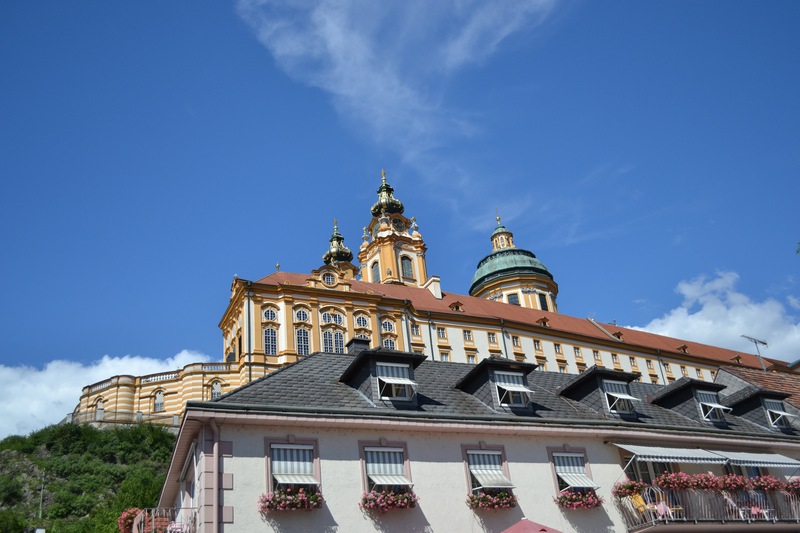 We then decided to drive to Melk. 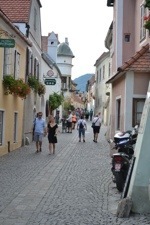 Our cruise had visited there and we had enjoyed the town. 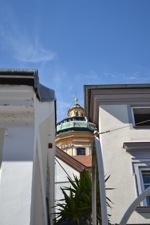 A beautiful abbey sits atop the hill, and the town has winding streets with cute shops. We first dat and had coffee/tea in the square. I was looking to recreate a great picture from our cruise, when after a morning tour of the abbey, a few of my shipmates and I grabbed a beer at a supermarket and sat on a bench drinking well before noon. Alas, while the bench was still there, the supermarket wasn’t. When I get home, I’ll publish the original picture. 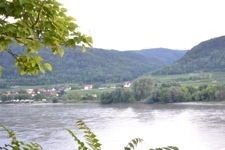 We drove along the Danube to Durnstein, where we are staying in a fancy hotel, the Hotel Schloss Durnstein. It is our splurge for the trip. After arriving. We walked through the town and were headed to the ruins of Richard the Lion Hearted’s castle, but it proved too steep to make it all the way up. We walked back to the hotel and enjoyed dinner at the hotel’s restaurant, which sat on a patio above the Danube. The food was delicious, we both had salmon, but we mainly enjoyed the sun setting and the cool air coming off the water. This entry was posted on Tuesday, July 31st, 2012 at 2:10 pm	and tagged with Danube, Vacation and posted in Bratislava, Vienna. You can follow any responses to this entry through the RSS 2.0 feed.